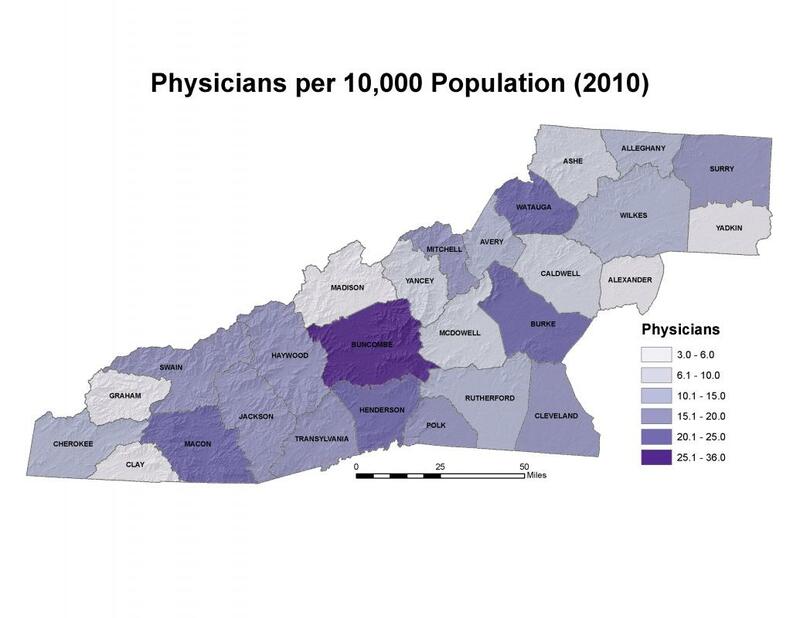 The number of physicians per 10,000 people varies widely throughout the Mountain Resources Commission (MRC) region, from a rate of only 3.2 per 10,000 people in Alexander County to a high of 35.2 per 10,000 people in Buncombe County. In 2010, four of the region’s counties – Buncombe, Henderson, Macon, and Watauga – had higher rates of physicians per 10,000 people than the state rate of 21.7, and Buncombe County's rate of 35.2 was 61 percent higher than that found for the MRC region as a whole. Overall, in 2010 there were 18.6 physicians per 10,000 people in the MRC region. Similarly, the number of registered nurses per 10,000 people also varies quite widely in the MRC region. 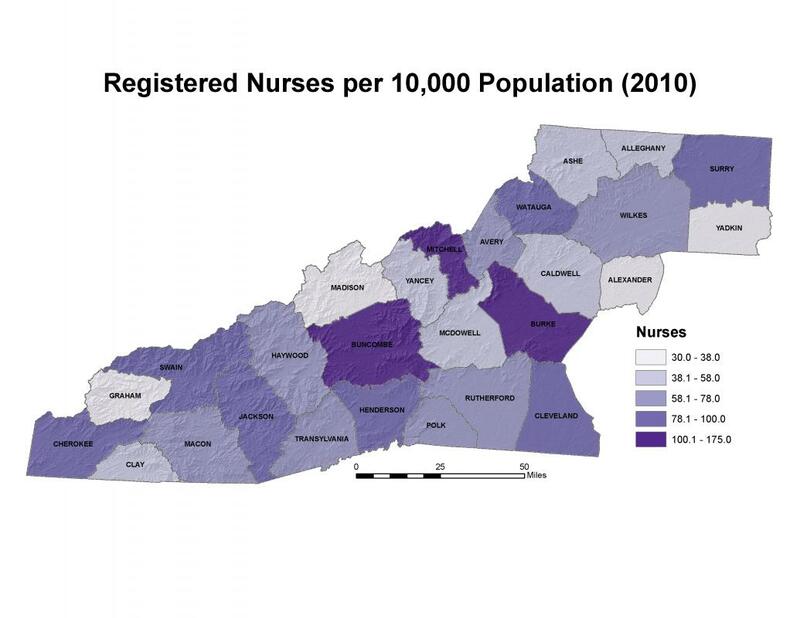 As with physicians, in 2010 Alexander County had the lowest rate of registered nurses in the region, with only 30.1 per 10,000 people, and Buncombe County had the highest rate, with 174.2 – 56 percent higher than the state rate and 68 percent higher than the rate for the entire MRC region. In the MRC region in 2010, there were 85.7 registered nurses per 10,000 people. In 2010, the MRC region’s rate of physicians per 10,000 people was 15% lower than the state rate, and was 12% lower than the state rate for number of registered nurses per 10,000 people. Cecil G. Sheps Center for Health Services Research, University of North Carolina at Chapel Hill. 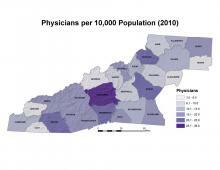 North Carolina Health Professions Data System: Annual Profiles 2010. Accessed from: http://www.shepscenter.unc.edu/hp/prof2010.htm.